Why do kids get to have all the fun? If you’re looking for a fun adult birthday party venue, you’ve come to the right place. Autobahn is the perfect venue for your party, and here’s why. It’s perfect for large or small groups. If you have a small group of guests, it’s easy to bring them in for a fun night of racing. No need for reservations; just arrive and drive. To be really prepared, you can fill out this waiver before you come. Have a large group? We’ve got you covered, too. Our large facility can accommodate your party of any size, and we even offer options to rent out the entire track for your party! Everyone loves a little friendly competition, especially to celebrate your birthday! We’ll give you a full report of racing results so you and your friends can compare your best lap times and find out who the biggest speedster is. If you rent out the facility, enjoy unlimited racing for you and your guests to find the true winner. Not renting out the place? You can still enjoy plenty of races with our daily specials. Check your location for exclusive deals. Go big or go home, right? If you have a party with us, your Event Sales Manager will help you find the right caterer, then we’ll handle the order, delivery, setup, and tear-down. Our goal is to make the entire process simple and efficient. It’s not your average party. 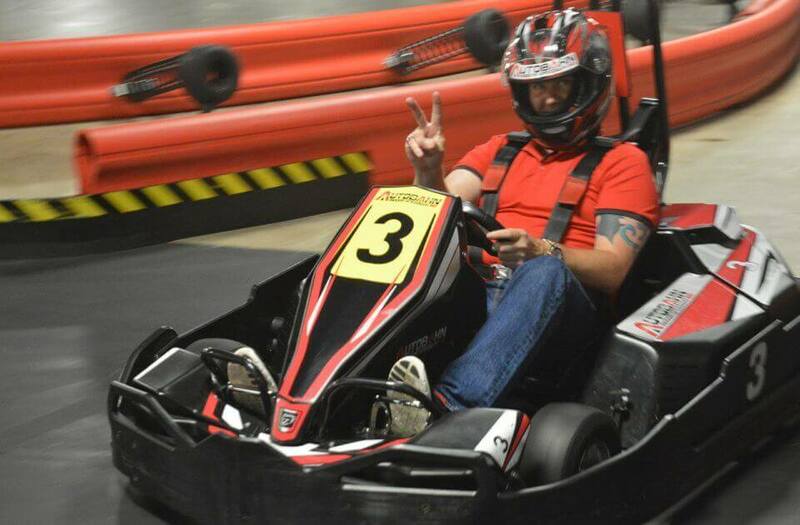 Indoor go-karting is new, it’s fun, and it’s a different. When’s the last time one of your friends had a party where you could reach speeds of up to 50 MPH, compete against all of your friends, and learn a new skill? Your party is sure to stand out when you bring it to Autobahn. So what are you waiting for? Ready to book your party? Let’s get started! Book your event here.